By now you all know I’m good friends with Angela Slatter. You should also know that I’m a huge fan of her work – it’s great when one of your friends is also one of your favourite writers. One of the best books I’ve read in recent years was Sourdough & Other Stories, Angela’s collection of short stories published by Tartarus Press. Not only is it a collection of brilliant stories, it’s a beautiful artifact of a book too. Tartarus make wonderful things. Well, Angela was supposed to write a sequel collection, but being the contrary writer she is, she wrote a prequel collection instead. It’s called The Bitterwood Bible and Other Recountings. 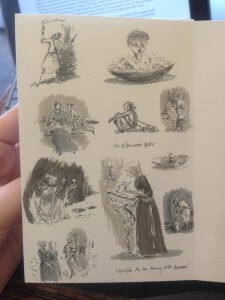 Tartarus agreed to publish it and Angela scored the amazing Kathleen Jennings to do internal illustrations for it. The result is a book even more beautiful than Sourdough, and equally chock full of amazing stories. I know that, because I’ve read it. The book’s not out til September 1st, but we’re friends, remember? So I got Angela and Kathleen to talk a bit about it and the process of its creation. You can read that below. At the end is a link to the Tartarus Press website where you can pre-order the book, and I really, really recommend that you do. And if you haven’t read Sourdough, buy that too and you can read it while you wait. I’m not just talking up my friends here, either – Sourdough was nominated for the World Fantasy Award and the Aurealis Award for Best Collection. These are books you do not want to miss. Over to Angela and Kathleen. 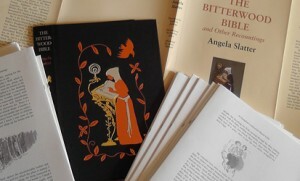 This entry was posted in fairy tales, News, On Writing: General, On Writing: Short Stories and tagged Alan Baxter, angela slatter, kathleen jennings, tartarus press, the bitterwood bible and other recountings. Bookmark the permalink.